The Danish Ruby Parure is, at this point in time, basically guaranteed at least one appearance per year: Crown Princess Mary wears it to the annual New Year’s gala banquet. She’ll wear it in portraits and for select other occasions – jubilee and birthday celebrations for her mother-in-law, Queen Margrethe; certain royal weddings – but uses other tiaras for the rest of her gala needs. Having just seen our scheduled 2017 ruby outing, it’s the perfect time to revisit this impressive set of jewelry and the impressive history behind it. This tiara tale begins, like many others, at the court of Napoleon Bonaparte. When planning his coronation as Emperor of the French in 1804, he wanted to ensure that it would be the grandest possible event. He went so far as to give money to his marshals so that they could buy their wives the proper amount of jewels for the occasion. One of those men, Jean Baptiste Bernadotte, bought a set of ruby and diamond jewelry for his wife, Désirée Clary, and she wore it on that historical day. This couple would later become King Carl XIV Johan and Queen Desideria of Sweden, and the jewels found a new Swedish home. In the modern history of this parure, it is so well associated with Queen Ingrid of Denmark (who was born a Princess of Sweden, and who wore this set frequently) that many assume it made the trip from Sweden to Denmark along with the rest of Ingrid's wedding gifts. In fact it came over much earlier, with another Swedish princess that became a Danish queen: Queen Louise, who married the future Frederick VIII in 1869. Louise received the parure as a wedding gift from her grandmother, Queen Josephine of Sweden (Désirée's daughter-in-law), because the rubies and diamonds echoed the colors of the Danish flag. Queen Louise gave the headpiece to her son Crown Prince Christian's bride Alexandrine as a wedding gift, and she received the rest when Louise passed away. 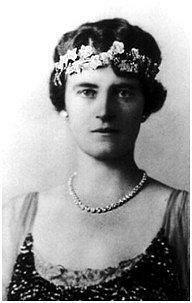 It was Alexandrine that gave it to Princess Ingrid of Sweden when she married Crown Prince Frederik of Denmark in 1935. 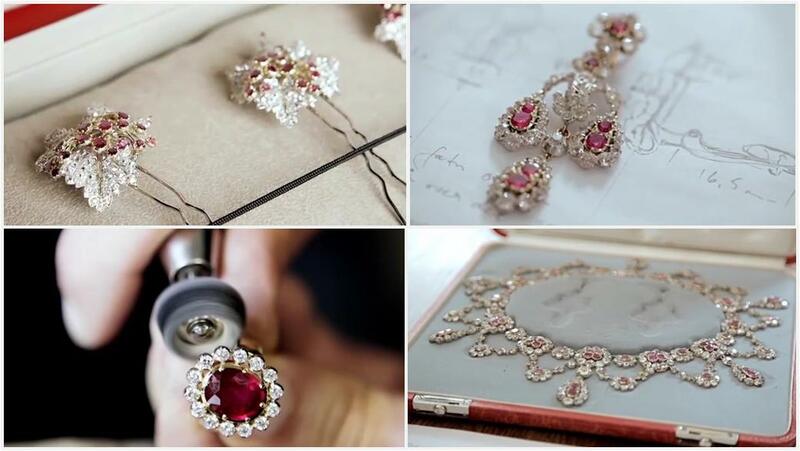 As with most jewels this old, alterations have been made over the years. The most extensive remodeling has been done to the tiara, which wasn’t even a tiara to begin with. 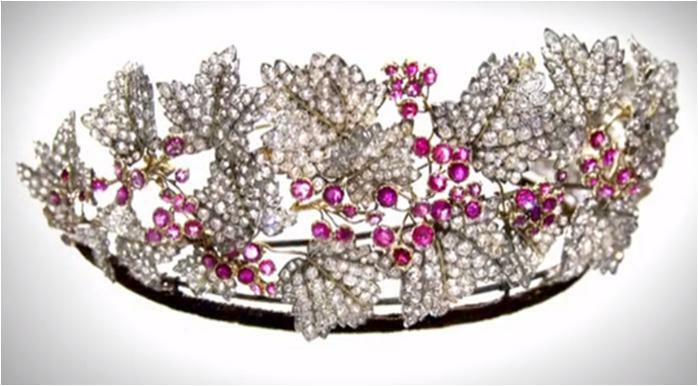 It started as a series of individual floral ornaments; these were later assembled into a slender wreath tiara, as seen on Queen Alexandrine and on Queen Ingrid when she first received the ruby set. Ingrid turned it into something more in 1947 by taking two of the brooches that came with the initial parure and adding them to the tiara, giving it much more substance and turning it into a proper diadem that still had a lovely wreath structure from the random placement of the leaves. 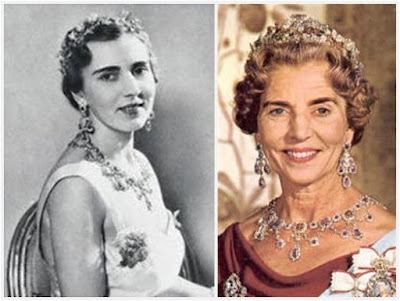 When Queen Ingrid died in 2000 she left the parure to her beloved grandson, Crown Prince Frederik, thereby ensuring that the future Crown Princess would have a truly grand and historical set of jewels to wear. 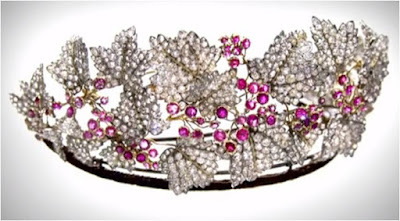 Mary wore this tiara for two of her pre-wedding events in 2004, making it the first tiara she ever wore. Mary followed in Ingrid’s footsteps by wearing the ruby set as it came to her for several years, and then having it altered to suit her own needs. In consultation with Crown Prince Frederik and Queen Margrethe, she had the tiara reconfigured and added extra flexibility to the rest of the set. This work was done by Dulong Fine Jewelry. Mary’s version of the tiara sits more upright on her head and feels more symmetrical and compact than Ingrid’s did; the alteration left a few leaves behind, and these extras were turned into a set of hairpins. She first wore the new tiara setting in 2010. The full Danish Ruby Parure now includes the tiara, the hairpins, a magnificent pair of girandole earrings which can be worn in several formats (as just the ruby and diamond studs, the studs with one of the ruby and diamond pendants, or the studs with a few different pearl drop options), a grand necklace that can be worn with or without its various pendant attachments, a brooch with a detachable pendant (the pendant can be used on a necklace chain; the brooch has been worn in various positions including on a velvet choker and has been worn with a pearl drop), a bracelet, and a ring (a new addition, made by the Dulong firm). Queen Ingrid tended to wear the whole ruby set at once, which is a grand but imposing amount of bling to add to an outfit. 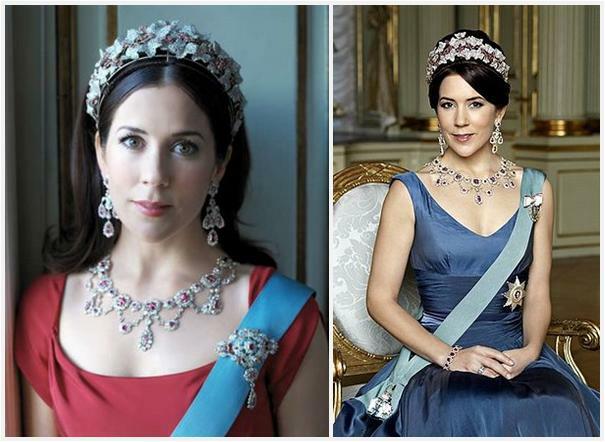 Crown Princess Mary started out wearing all the pieces at once, but she hasn’t worn it that way since she altered the tiara, preferring these days to pick and choose among the various pieces. I may miss the more natural feel of Ingrid’s tiara format and I may miss seeing the whole parure worn at once, but I can’t deny that Mary's changes have led to her using the set more creatively and to her using parts of the set without the tiara more frequently. She seems more comfortable with it, and this is all good stuff. Like I’ve said before: a girl’s gotta do what a girl’s gotta do. Of all the ways this set has been worn, which is your favorite?